Breaking the traditional HMI architecture mould, we introduce an innovative Cloud-based approach to HMI. The CloudHMI architecture comprises two parts - Server and Visualization Device. The Server Module connects with the PLC or Controller and publishes interactive Alarm data, Data & Event Logging, Recipe & Scheduled Events Manager, Process Trending, Macro Command Execution and much more, all perfectly integrated into the totally portable Apple iPad. 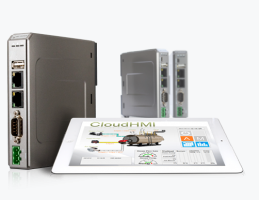 CloudHMI not only inherits the advantage of traditional HMI but also leads the trend of infinite innovation in HMI technology - CloudHMI leads the way.